Andrea serves as the Chief Mind Officer and client lead for Mind + Matter. Andrea supports client digital strategy, business operations, and managing Drew. Andrea graduated from Northwest Missouri State University in 2007 with a B.S. in Industrial Psychology and in 2008 with a Master’s in Business Administration. Following a ten year tenure at Cerner in marketing, sales, and client management she moved to an account focused role in Associated Wholesale Grocers’ in-house agency. Andrea enjoys creating meaningful partnerships to help her clients express and achieve their goals. When not at M+M Andrea can be found watching soccer, taking or teaching a yoga class, playing with her little beige puppy, or Instagramming her latest meal. Andrea’s philosophy is to find your true north, she strives to help others find and follow their driving purpose. Drew serves as the Chief Matter Officer and creative force behind Mind + Matter. 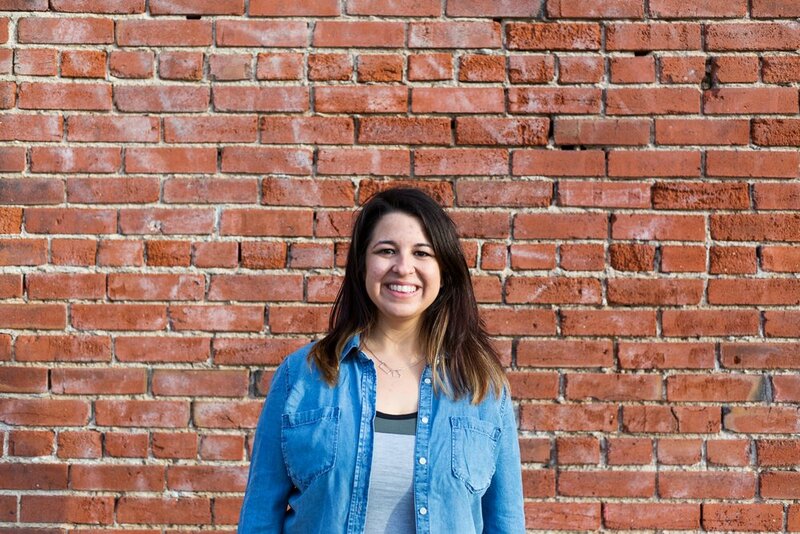 Drew’s primary focus is brand strategy, design, and managing Andrea. Drew graduated from the University of Nebraska - Lincoln in 2011 with a Bachelor of Fine Arts focused on Graphic Design. Drew has worked in marketing and design for the Lincoln Children’s Museum, Revolution Wraps, and Rensenhouse Electric. While in Lincoln Drew began to combine his talent for design with his soccer fandom by designing for The American Outlaws, the premier supporters’ group for the US Men’s and Women’s National Teams. In creating for this rowdy group of soccer fans Drew cultivated his ability to express powerful emotion through poignant design. When not pushing pixels Drew can be found watching soccer, taking or teaching a yoga class, training for his next race, or crafting his latest pun. Drew’s design philosophy is true to his character he likes to say a lot with very little. LP serves as Chief Puppy Officer for Mind + Matter. Her primary focus is organizational security, naps, and acquiring belly rubs. Eschewing traditional education, LP found most of her training through "real world" experience. Her silly puppy face and wiggly tail keeps morale high in the M+M offices. Truly a critical part of the team. When not providing valuable marketing insight LP can be found watching soccer, napping, hiding her treats, or playing with her latest hedgehog toy. LP's work philosophy is "you should probably be petting me right now." Brought together by their love of soccer, growing investment in the KC yoga community, and many gchats about individual projects Drew and Andrea had their first official collaboration with the launch Andrea's blog, Namasdre. Its reception made joking about their collabs being the hottest in the biz less of a joke, and Mind + Matter was born. Why Mind + Matter? Everything is better in pairs, when one enhances the other. Peanut butter and chocolate, macaroni and cheese, Andrea and Drew, the right creative with the right execution. While one can stand on its own, it's ultimately better with its counterpart. Mind + Matter is the combination of thoughtful strategy and meaningful execution to get you tangible results.